Satisfy your appetite for hip restaurants and culture in this diverse ’hood where museums like the National Portrait Gallery and the International Spy Museum keep company with eateries by celebrity chefs. Penn Quarter & Chinatown is home to the District’s Capital One Arena which plays host to everything from professional sports teams to American rock icons, plus intimate film and stage theaters, and it’s no surprise there’s action here from early til late. Foodies, culture vultures, shoppers and sports fans all find something to dig into in these neighborhoods north of Pennsylvania Avenue NW, which is as hopping at night as during the day. Museum fans can wander the Smithsonian Institution’s National Portrait Gallery and American Art Museum (both housed in the same neoclassical building), explore the ever-changing world of journalism at the Newseum or have the ultimate fan experience when you see the incredible wax figures at Madame Tussauds. Nearby, the United States Navy Memorial pays respect to veterans who served in the U.S. Navy with a commemorative public plaza, symbolic statue of a Lone Sailor and the Naval Heritage Center. By evening, theaters (both movie and live performance) fill up with throngs of people, including the classically minded Shakespeare Theatre Company, the avant-garde Woolly Mammoth Theatre Company, the indie-flick stalwart E Street Cinema and Sixth & I, a performance venue in a historic synagogue. If you’re a history buff, Ford’s Theatre, where President Abraham Lincoln was assassinated in 1865, is restored to look much as it did that night, and also holds an artifact-filled museum. Across the street is the site of Lincoln's passing, Petersen House, which is also open for tours. Expand your Civil War-era knowledge further with a trip to Clara Barton Missing Soldiers Office Museum, where the legendary caretaker tended to wounded Civil War soldiers. Restaurants from celeb chefs like José Andrés anchor a vibrant dining scene, with dozens of eateries, including high-style, high-end spots at CityCenterDC and down-home options just two blocks north in Chinatown (just look for the colorful Friendship Archway, which marks the latter and features 272 dragons). And when you've found the Archway, look for the nearby Pod Hotel DC, whose rooftop bar, Crimson View, offers the best bird's eye view of Chinatown. Sports fans flock to the Capital One Arena for pro-sports from Washington Capitals NHL hockey team, the Washington Wizards NBA team and the Washington Mystics WNBA team – and there’s also a buzzing pre- and post-game bar scene at spots along Sixth and Seventh streets NW. Indie plays at Woolly Mammoth Theatre Company, gazing out at the Capitol building from the Hank Greenspun Terrace at the Newseum. 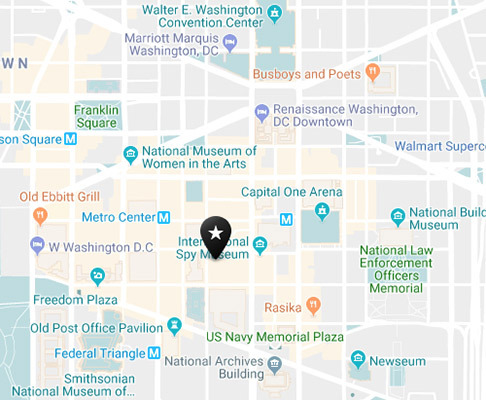 To land in the middle of this walkable zone, take Metro’s Red Line to the Gallery Place-Chinatown stop, or the Yellow or Green lines to the Archives-Navy Memorial-Penn Quarter stop. The Georgetown-Union Station Circulator bus also services the area, as do multiple Metrobus lines. Capital Bikeshare stations are also plentiful. Come hungry, leave entertained. That’s how it goes in Penn Quarter and Chinatown neighborhoods. Enjoy authentic food and then watch the Wizards, Capitals or Mystics play at the Capital One Arena. Click below to learn more about what to do after the game.